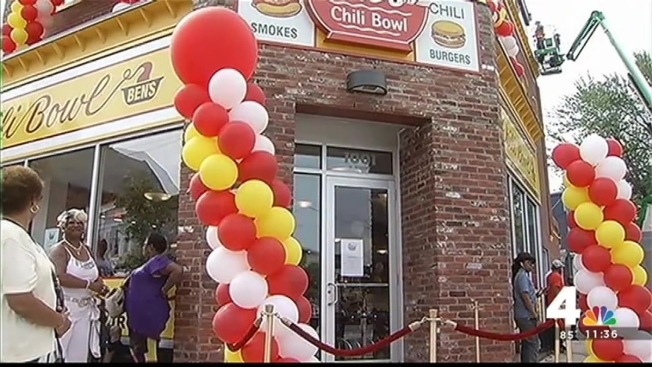 Ben's Chili Bowl Opens New H Street Location in D.C.
A D.C. institution opened a brand new location Wednesday. You can now get your half-smoke fix at the Ben's Chili Bowl on H Street NE. It is the chain's largest location. Congresswoman Eleanor Holmes Norton, Mayor Muriel Bowser and the Chuck Brown Band were on hand for a ribbon cutting ceremony. The restaurant has employed 50 workers from the community. Ben’s Chili Bowl has a rich history in D.C The original location opened nearly 60 years ago on U Street NW. Last year, the restaurant expanded to Virginia, opening a stand-alone location in Arlington. Satellite locations also dish up half-smokes at Reagan National Airport, FedEx Field and Nationals Park.